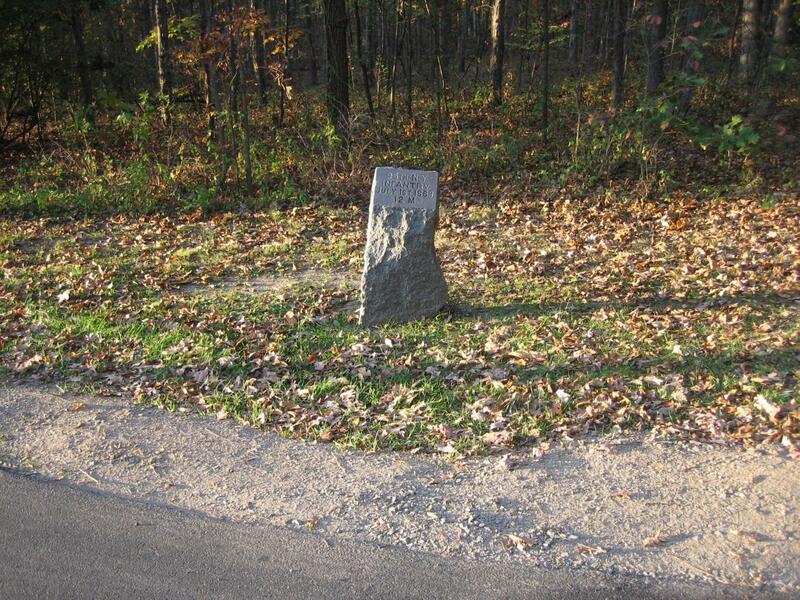 The marker showing the position of the 95th New York Infantry Regiment on Oak Ridge has not always been in its current location. In 1996, it, or what was left of it, was moved from its original location where it was being struck by vehicles. The “M” on the monument stands for the Meridian Hour or Noon. This view was taken from the southeast facing northwest at approximately 5:30 PM on Thursday, October 23, 2008. But has the National Park Service (or the War Department before them) moved markers and monuments? Sure they have. We would like to show you one that was moved approximately 12 years ago. During the administration of Superintendent Dr. John Latschar. 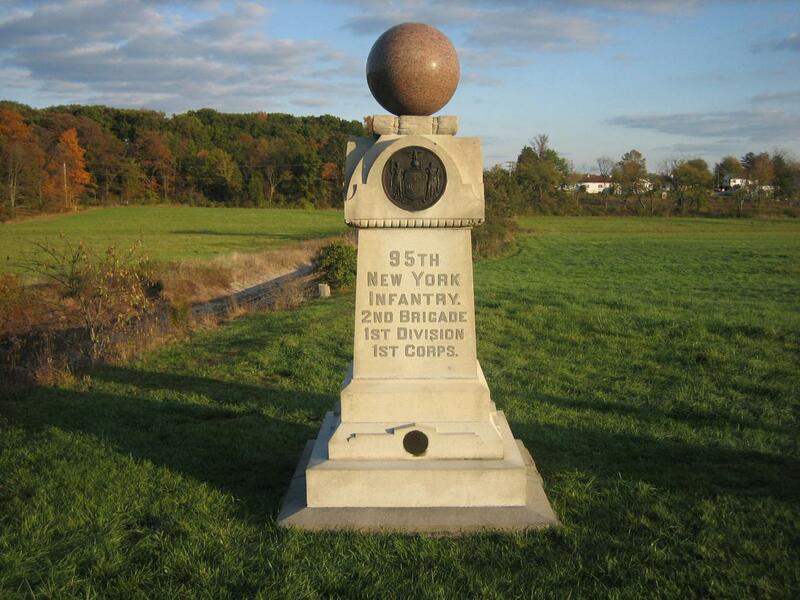 The primary monument to the 95th New York Infantry Regiment is located near the Railroad Cut at the eastern arm of McPherson’s Ridge. 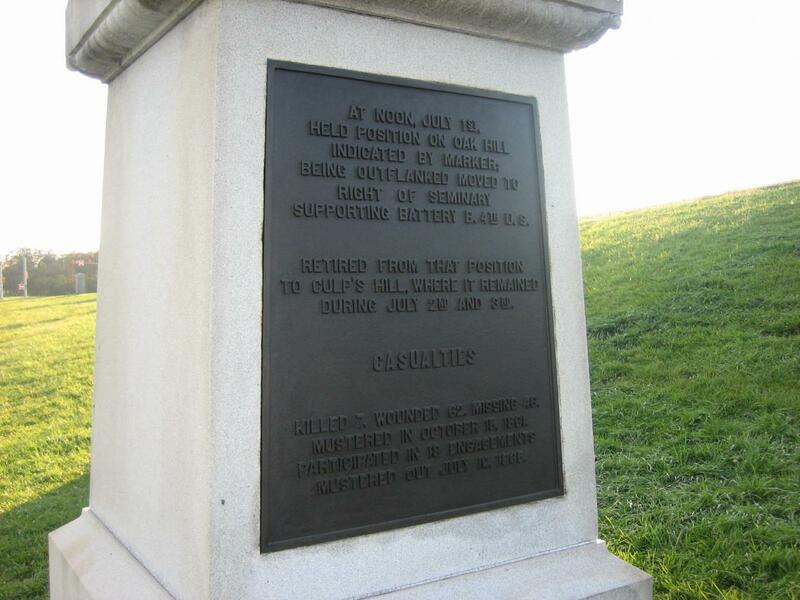 The monument was dedicated on July 1, 1893. This view was taken from the west facing east at approximately 5:30 PM on Thursday, October 23, 2008. 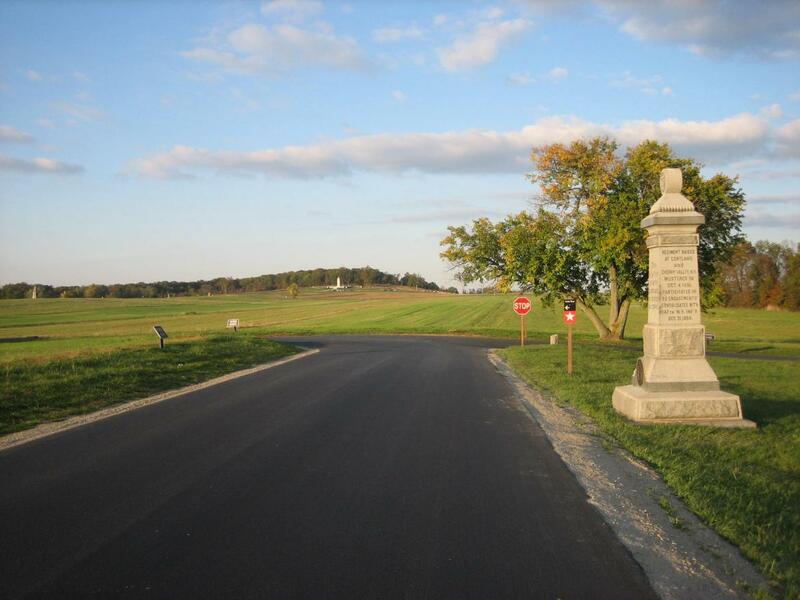 The regiment first fought on the eastern arm of McPherson’s Ridge when it arrived on the field, and was facing Confederates attacking from the west. After Confederates from North Carolina and Mississippi occupied the Railroad Cut, the 95th New York, along with the 14th Brooklyn (84th New York) and the 6th Wisconsin were ordered to face north. 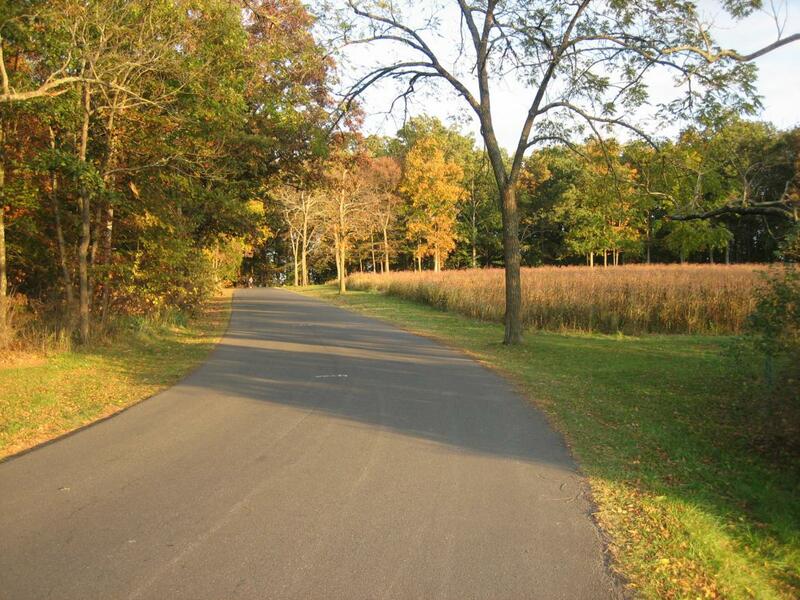 They attacked the Confederates in the cut moving from south to north or right to left in this picture. 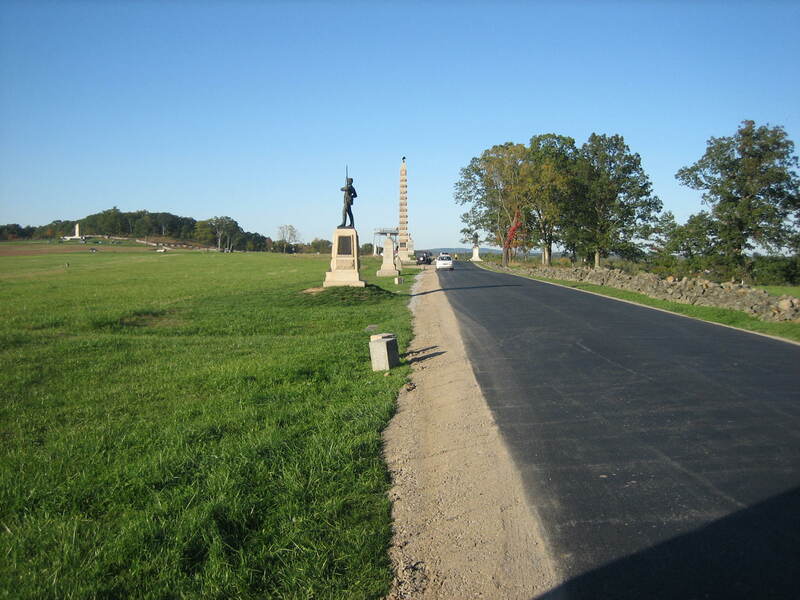 The brown colored monument to the 6th Wisconsin is on the right. 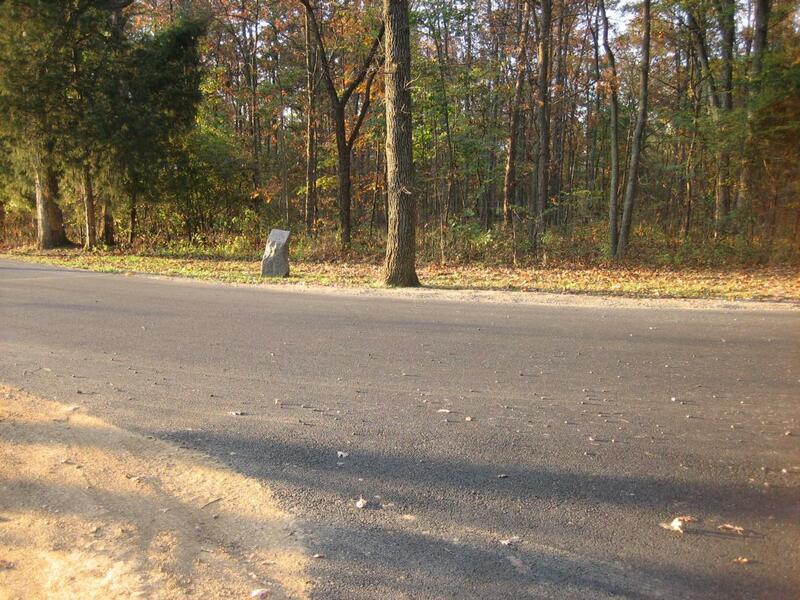 The left flank marker to the 95th New York is close to the camera on the right. 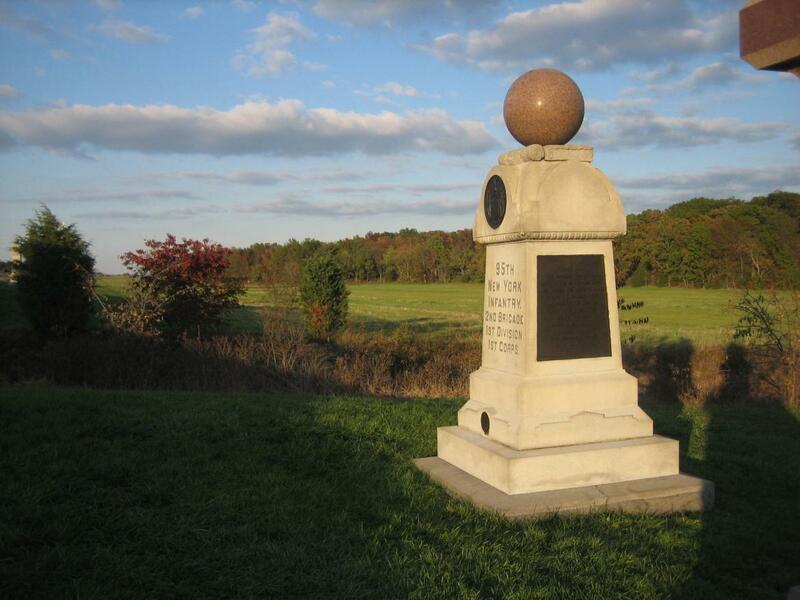 The 95th New York Monument is the lighter colored monument with the large brown ball (Full Moon, First Army Corps Symbol) on the top. 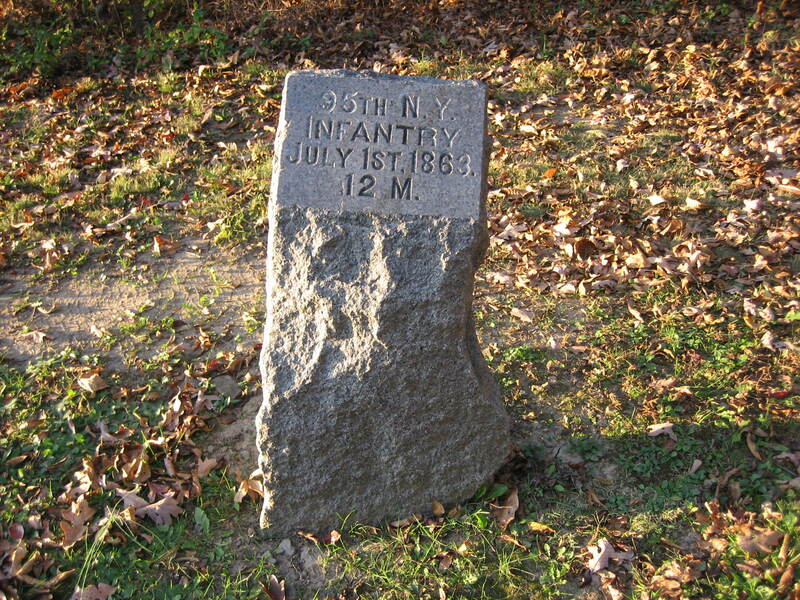 The right flank marker to the 95th New York is the small gray stone close to the railroad cut. This view was taken from the west facing east at approximately 5:30 PM on Thursday, October 23, 2008. 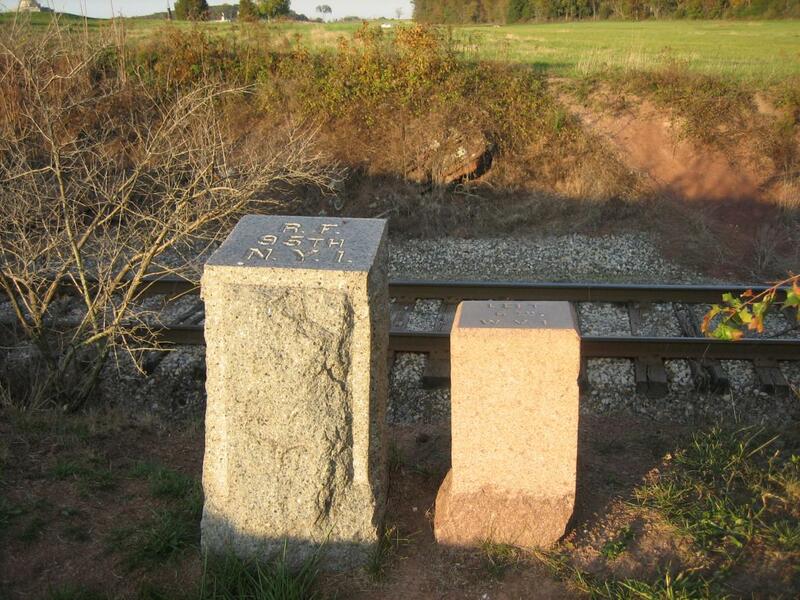 The 95th New York right flank marker, near the railroad cut, is to the left of the 6th Wisconsin small brown left flank marker. This view was taken from the south facing north at approximately 5:30 PM on Thursday, October 23, 2008. 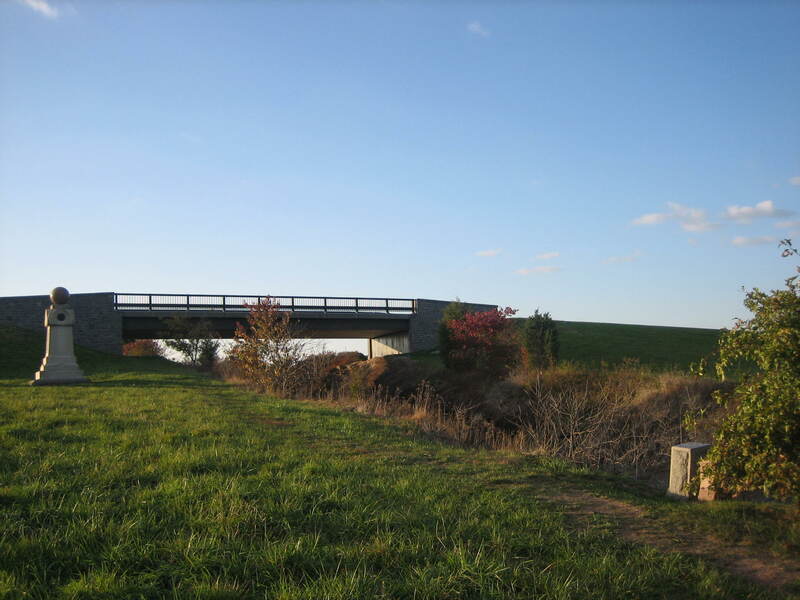 Here’s a view of the 95th New York position looking back toward the Reynolds Avenue Bridge or Railroad Cut Bridge. This view was taken from the southeast facing northwest at approximately 5:30 PM on Thursday, October 23, 2008. March 16th, March 21st, March 29th, April 8th, May 11th, May 23rd, May 30th, and June 30, 2008. After recapturing the unfinished railroad cut, the unit was pulled back to a new position. 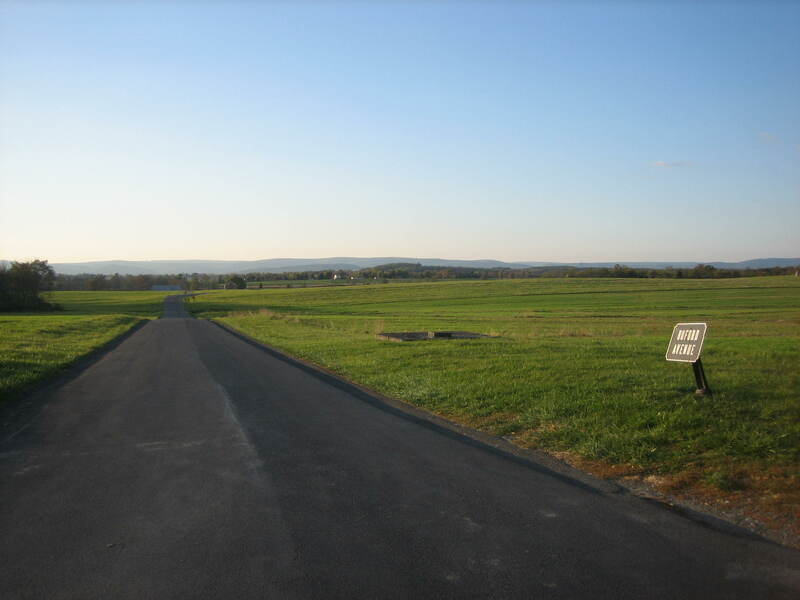 This view was taken from the northeast facing southwest at approximately 5:30 PM on Thursday, October 23, 2008. 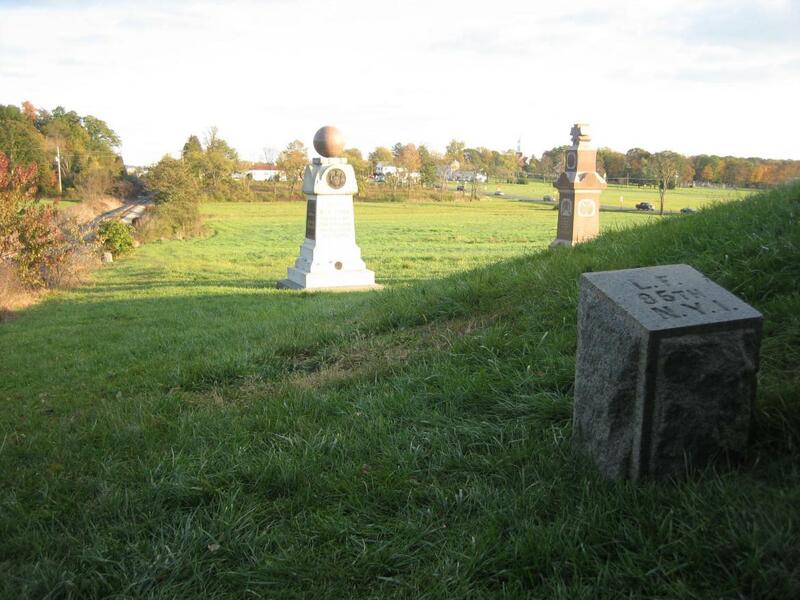 As the north side of the monument states, at noon, it held a position on Oak Hill (actually Oak Ridge) “indicated by marker.” This view was taken from the northeast facing southwest at approximately 5:30 PM on Thursday, October 23, 2008. 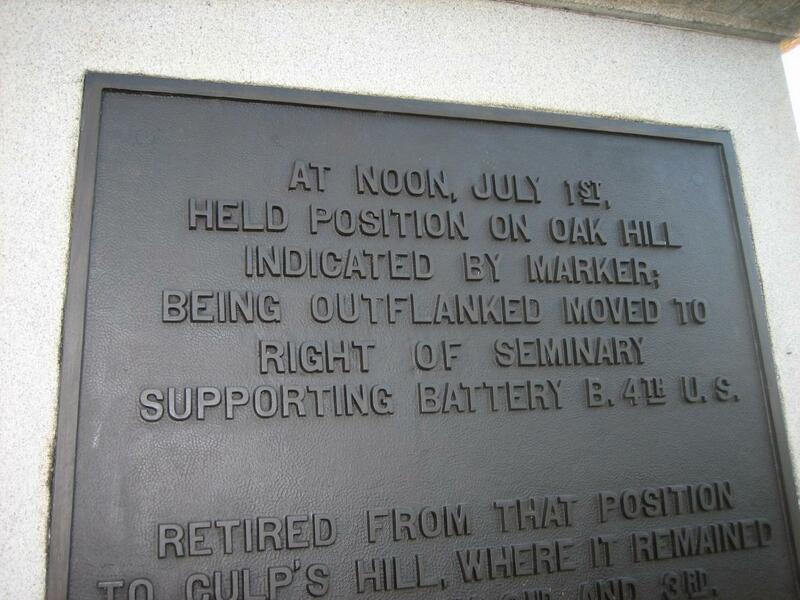 This position was located in the woods behind the marker on Oak Ridge. These woods were/are known as Sheads Woods. This view was taken from the southwest facing northeast at approximately 5:30 PM on Thursday, October 23, 2008. To get to the 95th’s marker, go north on Reynolds Avenue, over the bridge, to the intersection with Buford Avenue and Wadsworth Avenue. The monument to the 76th New York is on the right. The Eternal Light Peace Memorial is in the center background on Oak Hill. This view was taken from the south facing north at approximately 5:30 PM on Thursday, October 23, 2008. Do not take a left on Buford Avenue traveling west to the mountains. This view was taken from the east facing west at approximately 5:30 PM on Thursday, October 23, 2008. Take a right onto Wadsworth Avenue. The right flank marker to the 76th New York is on the right. This view was taken from the west facing east at approximately 5:30 PM on Thursday, October 23, 2008. This is Wadsworth Avenue, not Buford Avenue. This view was taken from the west facing east at approximately 5:30 PM on Thursday, October 23, 2008. 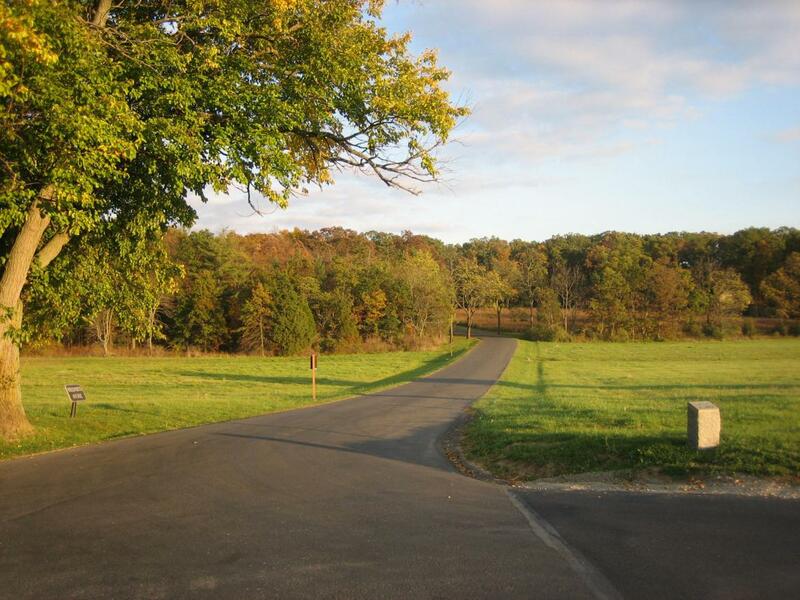 Drive up Oak Ridge, and remember that this is a two way road. This view was taken from the west facing east at approximately 5:30 PM on Thursday, October 23, 2008. As you approach the top of the ridge, on the right was a beautiful field of wildflowers, as late as last weekend. The cold weather we’ve had this week has taken care of them. This view was taken from the north facing south at approximately 5:30 PM on Thursday, October 23, 2008. 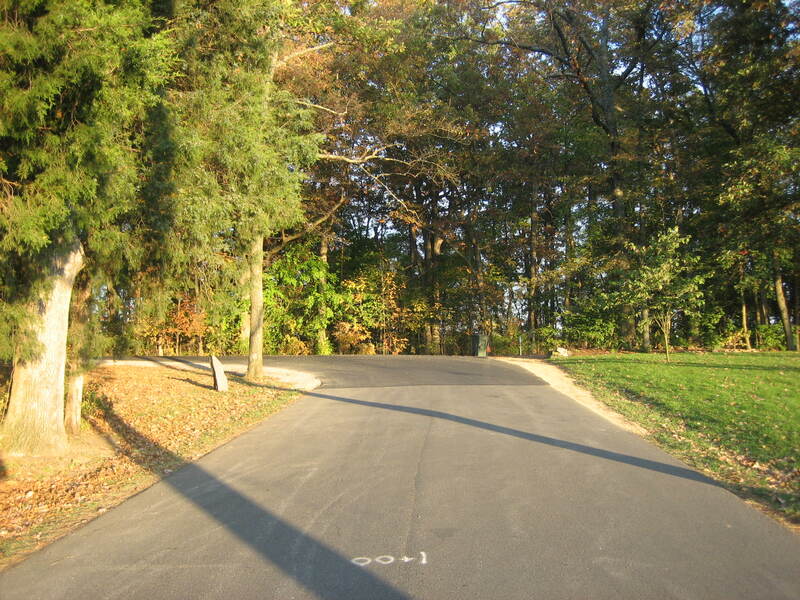 Near the top of the ridge, Wadsworth Avenue turns into Doubleday Avenue, which continues to the left or north. 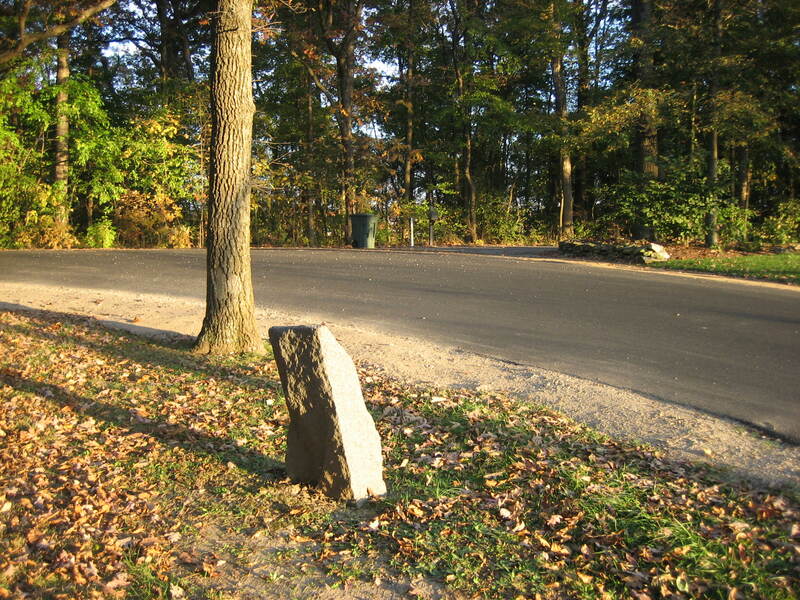 On the left side of the road, is the marker to the 95th New York showing its position at noon on July 1, 1863. But it has only been in that position for approximately twelve years. This view was taken from the southwest facing northeast at approximately 5:30 PM on Thursday, October 23, 2008. For over 100 years, the marker, placed by the veterans, was on the other (north) side of Wadsworth Avenue. However, because this is a two way road, vehicles, especially any buses trying to negotiate the curve at the intersection of Reynolds and Wadsworth Avenues would hit the marker. This view was taken from the north facing south at approximately 5:30 PM on Thursday, October 23, 2008. So the National Park Service, under the direction of Superintendent Dr. John Latschar, faced the “delicate balance between preservation of the historic monuments, respect for the veterans who placed the markers in carefully selected positions on the field at Gettysburg to mark the lines of battle, and allowing for visitor access and understanding.” They decided to move the marker from the right (south) side of Wadsworth Avenue to the left (north) side. This view was taken from the west facing east at approximately 5:30 PM on Thursday, October 23, 2008. We believe that this was the correct move. 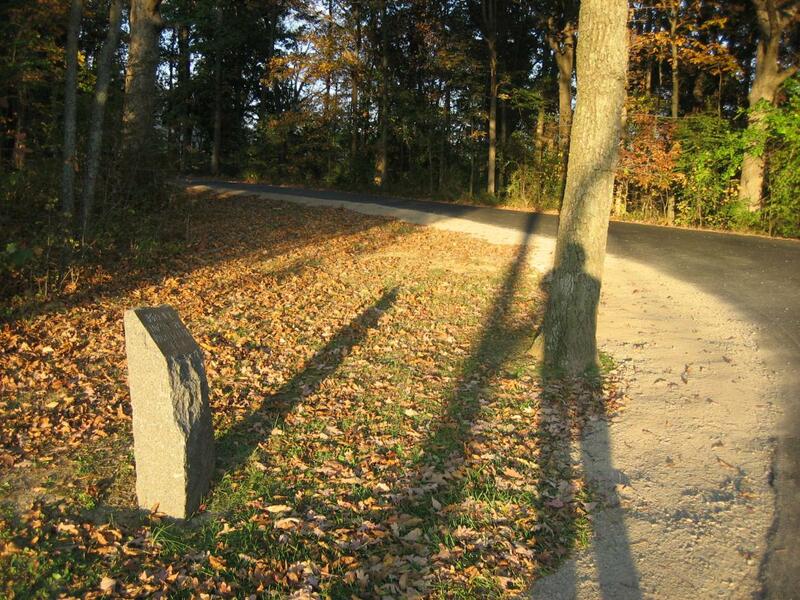 The National Park Service decided that the veterans would have wanted the marker moved in order to protect it. This view was taken from the northwest facing southeast at approximately 5:30 PM on Thursday, October 23, 2008. Currently this marker is doubly protected. Traffic coming from left to right on Doubleday Avenue to Wadsworth Avenue have to make sure they don’t cut the curve too sharply or they will hit the tree. This view was taken from the southwest facing northeast at approximately 5:30 PM on Thursday, October 23, 2008. 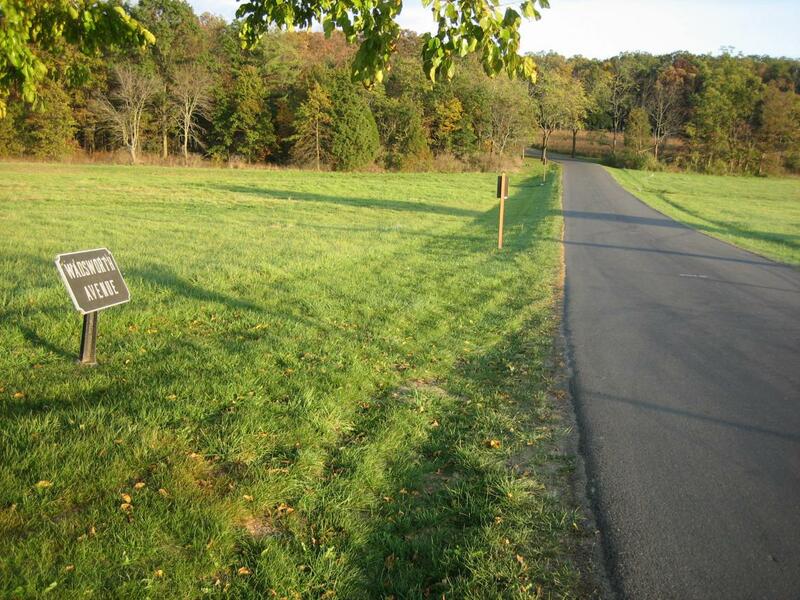 But the National Park Service didn’t only move the marker to the other side of the road. 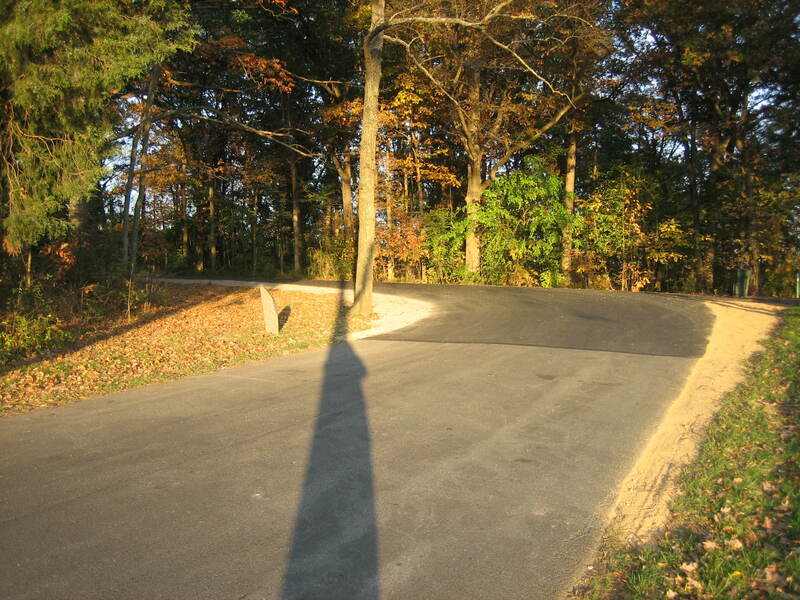 It is located, even with the current widening of the road, seven feet from the road. This view was taken from the southeast facing northwest at approximately 5:30 PM on Thursday, October 23, 2008. 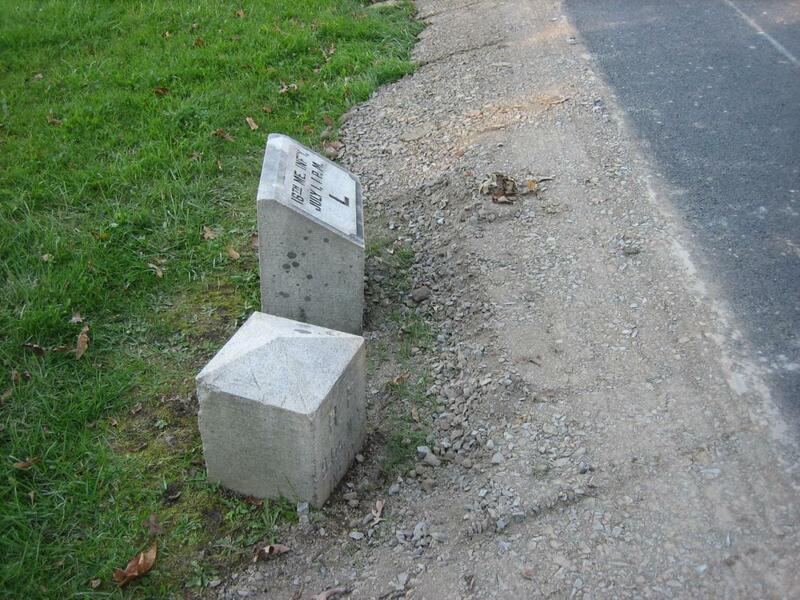 So why isn’t the same administration of the National Park Service doing the right thing now in moving markers that have been run over in their current location? This view was taken from the southeast facing northwest at approximately 5:30 PM on Thursday, October 23, 2008. In our opinion, the recent widening of avenues has placed more markers in danger of being struck by vehicles. 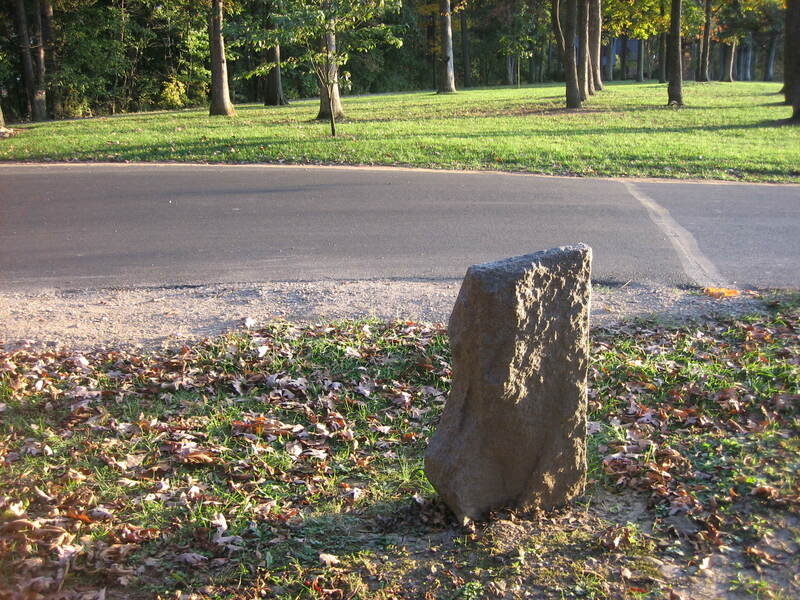 If the Park Service begins a precedent of moving markers any time they appear to be in danger, they will be moving more than a few markers. This view was taken from the south facing north at approximately 5:15 PM on Friday, October 10, 2008. This certainly is a problem now. 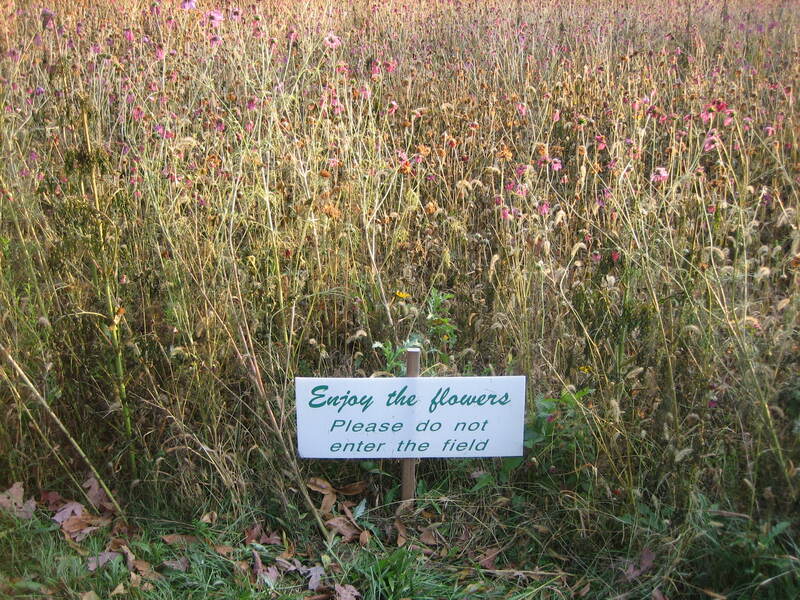 We just hope that the National Park Service looks at each marker’s situation on a case by case basis. As they did twelve years ago. This view was taken from the south facing north at approximately 5:15 PM on Friday, October 10, 2008.